More area and smoother transitions from the inlet to the outlet, resulting in less restriction than any other fitting line. The Aeromotive line of custom fittings, adapters and hose-ends are a step above the norm, offering uncompromised fuel flow and positive sealing. Constructed of 6061-T6 aircraft grade aluminum or stainless steel, each component is CNC-machined for precision fit and unmatched flow. All billet aluminum fittings are anodized Type II bright dip black for corrosion protection and unrivaled aesthetics. 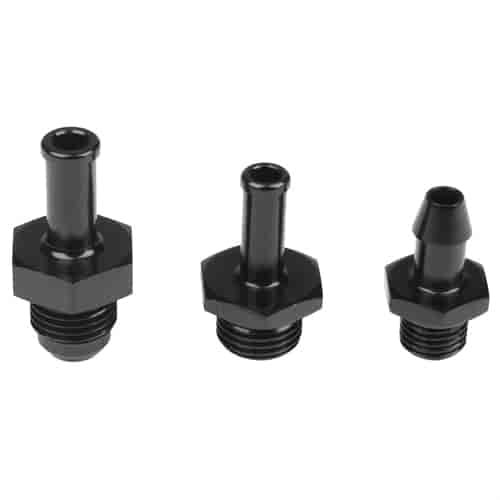 We offer a complete line of hard to find fittings from OEM specific connections to AN adapters. All Aeromotive fittings and adapters are fully compatible with gasoline and alcohol fuels.